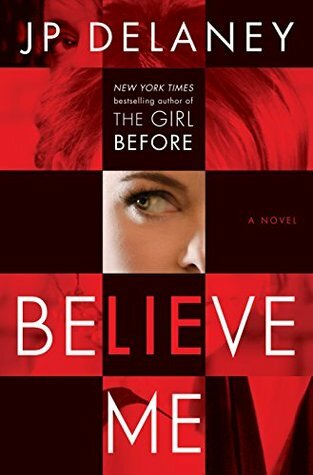 Believe Me by J.P. Delaney is a psychological thriller that brought out that side of me that argues with myself. My reaction while reading this one…. What?? Yes… well, no… yes… no way! Yeah, you get my point. The book begins with Claire doing what she does to earn money, propositioning a man in a bar. But it’s not what one would think in any way, Claire works for a law firm going undercover to catch cheating spouses since acting jobs are hard to come by for someone without a green card. Normally these jobs go very quickly for Claire, all she has to do is wait for the mark to approach her and flirt a bit all the while getting them on camera. But Claire is surprised when a mark doesn’t fall for her attempts but even more surprised when the wife is upset her husband didn’t cheat. What Claire never expected after the job was over was to find herself in the middle of a murder investigation. This is one that I’m not sure if it would be for everyone as it is certainly different. They style the author chose was one that took a little getting used to. A lot of the conversations and such are in an interview type of format but since the story was intriguing I went along with the differences well enough. Once the twists in the book begin to happen my internal debate meter shot off the chart and it wasn’t as if you are thrown a whole pile of suspects but the psychological side showed in playing mind games with the reader. In the end I was glad I picked this one up as it certainly was an entertaining read. Happy you enjoyed this one, too, Carrie! It was most definitely entertaining as you said! I loved your review! I had some issues with The Girl Before, so I almost didn’t request this, but now I’m glad I did. Awesome review Carrie! Thanks! Hopefully you’ll enjoy it well enough but it really did take some work to get used to the style in this one so hopefully it doesn’t bug you. Wonderful review Carrie, I do like psychological thrillers and this one sounds well done. Off to request. Already broke my promise to myself. Haha sorry Carla, it’s hard not to take a chance and get the ones that look good though, I should know. Thanks for the heads up about interview format.. I don’t like that kind of read much. This book is on my list to read so I’m glad to see you enjoyed more than disliked 😊 Great review Carrie! Thanks Jasmine, it definitely took some getting used to so hopefully you’ll still like it.